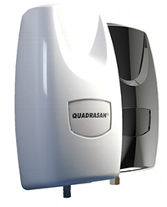 To reduce the risk of the buildup of uric salts, acids and organic waste within the pipe work we would recommend that Quadrasan sanitising units are fitted and maintained 6 times per annum. Once fitted no other cleaning agents are to be used concurrently with the auto sanitizer. For example; No bleach, toilet blocks Etc, these products will kill the enzyme based cleaning agents dispensed by the auto sanitizer. 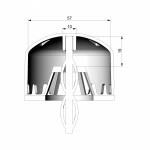 How does the EcoBug Urinal Cap system work? 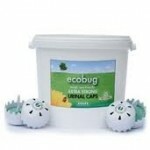 The EcoBug Urinal Cap is a simple dosing system. The bacteria in the cap are slowly dosed into the pipe work. The bacteria are designed to break down uric salt and out populate existing bacteria that give off nasty odours. Because of this process water doesn’t need to be flushed into the urinal quite so much. Once the cap is spent (6– 8 weeks) – Simply replace. Why is it so different to every other cartridge system out there? The cap simply ‘snaps’ into the existing urinal grate. All that’s required is a water management system set to flush once or twice a day, reducing both your water and carbon output. (Please see water management information in previous pages). Bad bacteria in the urinal environment degrade urine components to produce a strongly smelling molecules, resulting in the characteristic ammonia-like odour. Uric scale is formed by insoluble compounds in the urine, form unsightly deposits on the bowl. In extreme cases, build up of uric scale within the pipe work can cause urinals to block and overflow. Troublesome hard water scale (calcium and magnesium carbonates) can build up and lead to blockages in pipes. EcoBug 3c The Green Cube uses good bacteria to turn your existing trough or bowl facility into a touch free Waterless Urinal. The Green Cubes are simply placed in the base of the urinal and the water supply is turned off. A small amount of water is then poured over each day to activate the cubes and clear the trap of debris. The good bacteria in The Green Cubes are released as the cubes slowly dissolve, not only naturally degrading to the compounds that cause scale they also out compete the bad bacteria that causes unpleasant odours. EcoBug’s Green Cubes cut water consumption and discharge costs for urinals by 98%. Reduce plumbing call ours for blocked pipes. Reduce maintenance costs for cisterns, sensor replacements and automatic valve replacements. Eliminate the costs of purchasing chemical sanitisers and also save your business the time spent dealing with these issues. Build brand and business reputation by aligning with growing community environmental values. Demonstrate corporate leadership with and innovative approach to water conservation. Be seen to be doing the right thing, and help your company towards obtaining ISO 14000/ISO 14001. The Sani-Sleeve is a low cost consumable and can be retro-fitted to existing urinals as well as fitted to new units. Their odour locking designs lines the internal surface of the waste outlet pipe work which is a major source of unpleasant smells. The Sani-Sleeve unit contains good bacteria and enzymes which deal with the cause of smells and causes of blockages. The bacteria feed on the uric salts present in the pipe work, which become soluble and are washed away on the next flush. In addition, the impregnated fragrance of the block refreshes the washroom and makes the gents toilets smell pleasantly all year round. The units are serviced/replaced quarterly to ensure that the bio enzymes that are present in the unit continue to work. 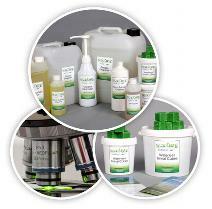 Ecobug Cleaning Solution is an effective environmentally-friendly general cleaner for washrooms which can be used around the toilet basin and urinal areas. 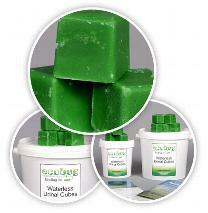 It is the perfect complement to our ecobug® caps, cubes and Biomiser products. Ecobug® High Performance Washroom Cleaner is an effective blend of naturally-occurring microbes which degrade the organic matter that odour-producing bacteria normally grow on. It manages odour and the microbes convert uric scale into more soluble compounds, which prevents deposit build up. Highly effective scenting allows for a fresh cleaner, greener smell in your washrooms. The product is available in a very cost effective concentrate format and the specially issued pump adaptor allows for accurate concentrate delivery into the hand spray containers.